- a prompt, fast and efficient service we keep using"
We have found that the level of service you guys provide are second to none. When they say they will be collecting or dropping of at a certain time, they are always there, or, if they get held up they are straight on the phone with an update. 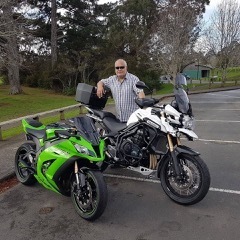 In the time we have used Chase Motorcycle Movers, to pick up and drop off bikes, we have never had one incident or negative comment from a customer - they look after all bikes as though they were their own. I cannot say anything other than keep up the great work and here's to a long term partnership. We, at Wheels Two and Four Ltd in Carterton, have been buying and selling motorcycles for some time now. The Chase team are on to it, with their prompt pick up and deliveries. Our bikes are picked up when they say and delivered when they say, and, in the condition they were picked up in. Also great communication and great service! As a company, we know looking after your customers is a top priority and Chase Motorcycle Movers do it well. Many thanks to the Chase team for looking after us and our customers. Wheels Two and Four Ltd.